Okay, I'm a little late on this one, but it's worth talking about all the same. New solicit information and cover art for Archie's Mega Man #10 has hit the web, detailing the gist of the on-going Mega Man 2 story arc. Things are certainly heating up, and if the cover art is any indication, this issue's going to be a doozy! “Dr. Wily Returns,” Part Two. Dr. Wily is back, and this time he has eight new Robot Masters of his own! Mega Man must track down and defeat each one before they complete their missions and conquer the world for their mustachioed master. It’s hard enough when each new Robot Master is deadlier than the last, but how can the Blue Bomber succeed with Quick Man tripping him up every step of the way?" --- 32 pages, $2.99. That Quick Man... what a fiend. Hopefully, our blue bomber will remember to lay down the law with the Time Stopper. Well, maybe not initially; that'd make for a pretty boring fight. Can you believe we're halfway through the first year of Archie's Mega Man? I know, right? That was, like, Quick Man fast! It's onwards and upwards from here. 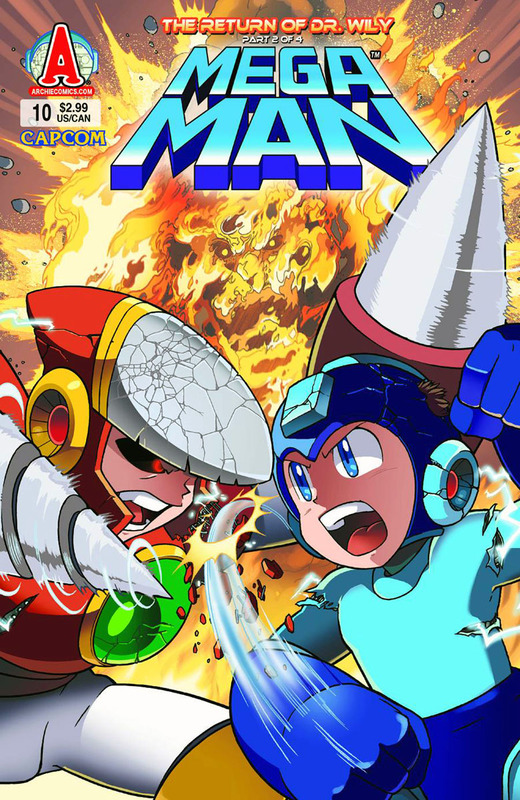 With satisfying sales, the future looks bright for Archie and Mega Man. "That Quick Man... what a fiend. Hopefully, our blue bomber will remember to lay down the law with the Flash Stopper." I think you mean Time Stopper. Flash Stopper is Bright Man's weapon from Mega Man 4. "Can you believe we're almost one year through Archie's Mega Man?" I guess Quick Man might get a bigger role than normal, if I'm reading this right. Eh, I've changed it to "halfway through"
Eeash! What's wrong with Crashman's eyes? He looks so serious! Still, we haven't seen variant covers for the newer issues, I really want a Bubbleman Variant to frame. uhhh... yeah. What's with Crash Man's eyes? And that's when I'll officially stop buying this comic. Why buy it if I can't stand looking at it, right? Word of advice Archie guys, Capcom's robot master designers knew their stuff. We like these characters BECAUSE of the way they look. Don't mess with them. Crash Man seems to be more serious and dangerous than his appearance in Super Adventure Rockman, and he was tough in that game!